This week we celebrated the centenary of the birth of Jackie Gleason, the famous actor and comedian. He was born in Bushwick, Brooklyn 100 years ago, on February 26th 1916. His parents were Herbert Walton Gleason (an insurance auditor) and Mae "Maisie" Kelly (from Cork), and they baptised him John Herbert Gleason. Unfortunately, Jackie's childhood was marred by several tragic events. His older brother Clemence died of spinal meningitis when Jackie was only 3 years old. In 1925, when he was 9, his father walked out on the family, just before Christmas, and never returned. And Jackie's mother died in 1935 leaving him destitute and homeless. He was 19 years old with nowhere to go. He did a variety of odd jobs - working in a pool hall, as a stunt driver, as a carnival barker, and as a Master of Ceremonies in a local theatre for $4 per night. He was eventually "discovered" by Jack L Warner of Warner Brothers and at age 24 landed a film contract for $250 a week. Movie roles followed and soon he was enjoying a Hollywood lifestyle, becoming famous for his all night parties in his hotel suite. The Hotel Edison soundproofed his suite out of consideration for its other guests! 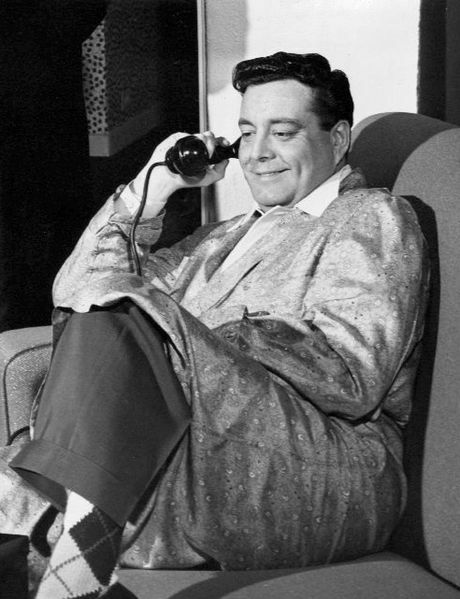 However, it was when Jackie turned to television that his fame shot through the roof and he soon became America's most popular comedian, starring in TV shows such as The Life of Riley, The Jackie Gleason Show, and most famously The Honeymooners, in which he played loud-mouthed bus driver Ralph Kramden whose get-rich-quick schemes had to be constantly quelled by his long-suffering wife Alice. Jackie was a multi-talented artist and had a photographic memory - he would read the script once and shoot the show later that day. 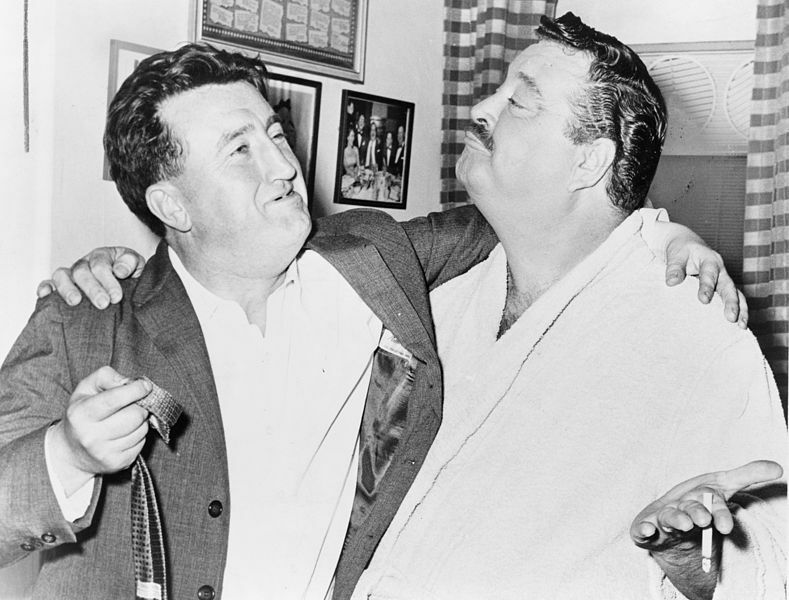 In 1964, he moved production of The Honeymooners from New York to Miami Beach where the Jackie Gleason Theater still stands. He had a variety of famous catch phrases in the show, including "You’re a riot, Alice" and "One of these days, Alice, pow, right in the kisser!" He was also a talented composer and singer. His first album Music for Lovers Only holds the record for the album longest in the Billboard Top Ten Charts (153 weeks). He won a Tony Award in 1960 for Best Performance by a Leading Actor in a Musical (Take Me Along). His portrayal of pool shark Minnesota Fats opposite Paul Newman in The Hustler won him a Best Supporting Actor nomination at the 1961 Academy Awards. Jackie made all his own trick pool shots, thanks to the many years he spent as a teenager in the pool halls of Brooklyn. Another of Jackie's most memorable characters was the beleagured Sheriff Buford T. Justice, who appeared in all three Smokey and the Bandit movies (alongside Burt Reynolds and Sally Fields). In one memorable scene he turns to his inept son Junior and says "There is no way, no way, that you could come from my loins. Soon as I get home, the first thing I'm gonna do is punch your momma in the mouth." For many years he would only travel by train following an incident where a plane he was on had to make an emergency landing after losing two engines. Jackie had a great interest in the paranormal and was a regular guest on an overnight paranormal radio show in the 1950's. 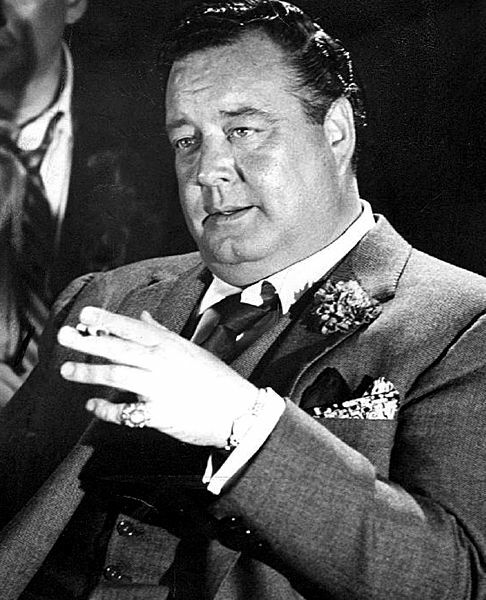 Some of his best friends were Humphrey Bogart & Peter Lorre. Jackie has received several civic honours - he has a place on Brooklyn’s Celebrity Path at Brooklyn Botanic Garden; in 1988 Brooklyn’s real-life Fifth Avenue Bus Depot was renamed The Jackie Gleason Depot; and in 2000, a life-size statue of Jackie Gleason, in uniform as bus driver Ralph Kramden, was installed outside the Port Authority Bus Terminal in New York City. Jackie was married three times and had two daughters (Geraldine & Linda) with his first wife Genevieve Halford. His daughter Linda (born 1942) became an actress and married fellow actor Jason Miller (1939-2001). Their son is the actor Jason Patric. Jackie passed away on June 24th 1987 at his Florida home. He is buried at Our Lady of Mercy Catholic Cemetery in Miami. According to a family tree on Ancestry, Jackie's great grandfather was a Joel Gleason born in 1808 in Vermont. It would be interesting to find out if there are any male descendants who would be willing to be DNA-tested. This could help clarify where Jackie's Gleason line originated and might connect him to cousins still living today. 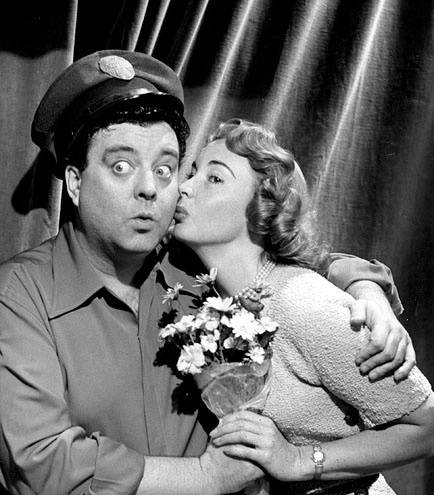 Jackie's legacy lives on in his many movies and TV shows, some of which are available on YouTube, like the episode from The Honeymooners below. Great man. I visited the JG studios in Miami in a Lutheran convention in 1964 0r 65. He was a great entertainer and had family in my area apparently (Melbourne, FL). Loved you in the Steve McQueen movies. Didn't care for the Honeymooners because of all the arguing and yelling (which I could get enough at home). You WERE the greatest, fat man.